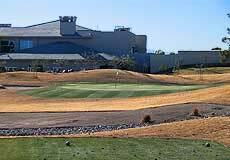 Those who have played Wildhorse in past years are well advised to visit the property again - as renovations that took place in the summer of 2004 have created a very different look to the course and facilities. 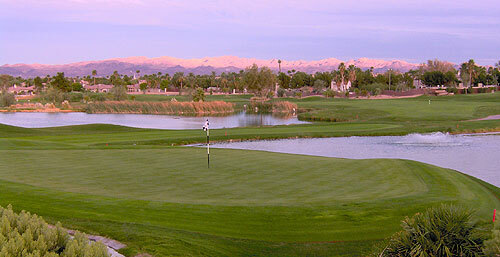 The course has always presented outstanding views of the area's desert mountains, as attested in the photographs below. 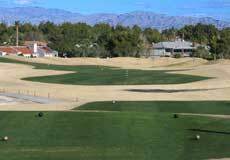 Four sets of tees now provide golfers the choice of playing to distances/slopes measuring 6525 yards/136 slope, 6037 yards/127 slope, 5529 yards/113 slope and 4995 yards/109 slope from the forward tees. 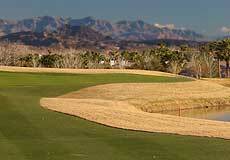 The most obvious upgrade is to the conditions of the playing surfaces from tee to green. The putting surfaces, which are large and mildly undulating, have been resurfaced with TifEagle - which in our experience is one of the best warm weather strains of grass available. This upgrade affords faster, more true rolling surfaces that can be easier maintained all year long. The property is also now home to the First Tee Program - which means that practice facilities have been upgraded. 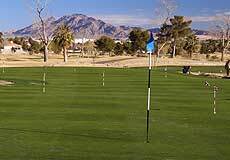 Below is a photo of the large putting/chipping green that fronts the clubhouse. There also is a spacious, targeted grass range. The redesign on this mildly rolling terrain also includes the addition of two new holes - numbers 17 and 18 (pictured below). The former is a dogleg left par four and the latter is an interesting par three finishing hole that is situated just in front of the clubhouse. This facility includes a pro shop and small restaurant - with an outdoor snack bar also located adjacent. 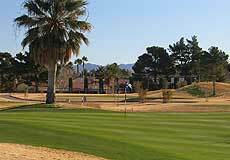 Wildhorse is now a municipally operated facility catering to the local golf market - and is quickly becoming a community favorite. 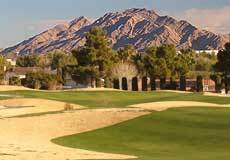 Mountain views, palm and pine lined fairways and subtle greenside mounding are all trademarks. Lights will be added to the range - with the public welcome for both golf and practice. 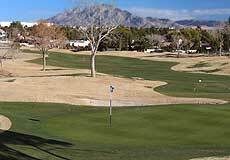 Private and group lessons of all types are available through the Wildhorse Golf Academy. Clinics and group outings can also be arranged. 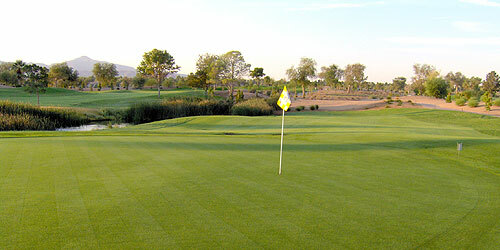 We encourage golfers to experience the "new look" at Wildhorse - As we were... we feel you will be pleasantly surprised. Rates are very reasonable for the Vegas area, and the property is conveniently located close to both downtown and the strip. 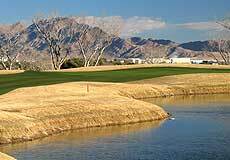 For more info, visit our page for Wildhorse on our web catalog of courses to play in Vegas by clicking here.